All orders of $99 or more to the United States get free shipping. Standard shipping ($7.95) is 3-7 business days within the continental United States. Orders to Canada take about 15 business days to arrive, and customers are responsible for any customs fees. Orders to Alaska, Hawaii, US territories and dependences, and military/diplomatic overseas addresses are delivered by the US Postal Service in accordance with their normal delivery practices. Expedited Shipping ($9.95) is 2-3 business days within the continental United States via US Priority Mail. FREE Shipping: Never pay for shipping while you're enrolled—a savings of $95 per year. Price Protection: Never be subject to price increases while you're enrolled. Always on Time: Never run out because we'll automatically ship you a 3-month supply of your products every 3 months, without having to call or pay for standard shipping. Total Flexibility: You have complete control to change, pause, or cancel your automatic shipments at any time. 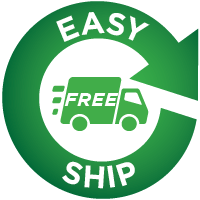 If you would like to adjust the frequency or quantity of a product on Easy Ship, please call customer service at 800-634-0905. We will be happy to help Monday-Thursday from 8:00 am to 8:00 pm EST or Friday from 8:00 am to 6:00 pm EST. We hold ourselves to the highest possible standards—your 100% satisfaction. If, for any reason, you are not completely satisfied with one of our supplement products, simply return the unused portion (or an empty bottle if that's all that's left), up to 90 days after your date of purchase, for a full refund of the purchase price (less shipping and handling). It’s that simple. When returning a product, please be sure to include your order ID, which can be found on the packing slip or in your confirmation email, so that we are able to properly credit your return.